Establishing and development of TRANSBETON Ltd.
2000 Establishment of the TRANSBETON Ltd. company, specialized in producing and selling fresh concrete including comprehensive services like transport and pumping of concrete. Purchase of a facility in Hustopeče, Břeclav region, containing an already standing SB 20 concrete plant with an output of 20 m³/hour, storage piles for three types of aggregate and silos for storing two types of binding agents (cement, fine ash or slag). 2003 Purchase of a facility in Skalice nad Svitavou, Blansko region, containing an already standing SB 20 concrete plant with an output of 20 m³/hour, storage piles for three types of aggregate and silos for storing two types of binding agents (cement, fine ash or slag). This concrete plant was rented during 2003-2014. Purchase of a facility in Brno containing an already standing Stetter M1 concrete plant with an output of 40 m³/hour, 4-chamber aggregate hopper and silos for storing two types of binding agents (cement, fine ash or slag). 2006 Refurbishment of Hustopeče concrete plant, replacement of the original SB 20 plant for a new modern horizontal Stetter H1-RS concrete plant with an output of 55 m³/hour, a 4-chamber in-line aggregate hopper and silos for storing three types of binding agents (cement, fine ash or slag). Construction of a new facility and concrete plant in Mikulov, Břeclav region, first launch of a SB 30 concrete plant with an output of 30 m³/hour, storage piles for four types of aggregate and silos for storing three types of binding agents (cement, fine ash or slag). 2008 Refurbishment of Brno concrete plant, replacement of the original Stetter M1 plant for a new vertical Stetter V2-M concrete plant with an output of 90 m³/hour, 5-chamber tower hoppers for storing aggregate and silos for storing four types of binding agents (cement, fine ash or slag). Construction of a new facility and concrete plant in Znojmo, first launch of a Stetter H1 concrete plant with an output of 45 m³/hour, 4 chamber in-line aggregate hoppers and silos for storing three types of binding agents (cement, fine ash or slag). 2010 Purchase of an extensive industrial facility in Přerov containing an already standing concrete plant with an output of 50 m³/hour. This facility has been entirely revitalized and is prepared for the future refurbishment of the concrete plant. 2012 Refurbishment of the Přerov concrete plant, replacement of the original Stetter V0,75 plant for a new modern vertical MERKO VB 1,5 D concrete plant with an output of 75 m³/hour, a 4-chamber tower aggregate hopper and silos for storing four types of binding agents (cement, fine ash or slag). 2014 Refurbishment of the Mikulov concrete plant, replacement of the original SB 30 plant for a new modern vertical MERKO HBS 2 DKXS concrete plant with an output of 75 m³/hour, a 5-chamber in-line aggregate hopper and silos for storing four types of binding agents (cement, fine ash or slag). Purchase of a facility in Kroměříž containing an already standing SB 20 concrete plant with an output of 20 m³/hour, storage piles for three types of aggregate and silos for storing two types of binding agents (cement, fine ash or slag). Purchase of a facility in Holešov, Kroměříž region, containing an already standing Stetter H1 concrete plant with an output of 45 m³/hour, storage piles for four types of aggregate and silos for storing three types of binding agents (cement, fine ash or slag). 2015 Refurbishment of the Skalice nad Svitavou concrete plant, replacement of the original SB 20 plant for a new modern horizontal Stetter 2,0 RS concrete plant with an output of 80 m³/hour, a 5 chamber in-line aggregate hopper and silos for storing four types of binding agents (cement, fine ash or slag). Refurbishment of the Kroměříž concrete plant, replacement of the original SB 20 plant for a new modern horizontal MERKO HBS 2 DKXS concrete plant with an output of 75 m³/hour, a 5 chamber buried in-line aggregate hopper, cement management for storing four types of binding agents (cement, fine ash or slag) and new recycling equipment for processing residual concrete. 2017 Refurbishment of the Znojmo concrete plant, replacement of the Stetter H1 technology with an output of 45 m³/hour for a new modern horizontal MERKO HBS 2 DKXS concrete plant with an output of 80 m³/hour. Purchase of a facility in Kopřivnice, Nový Jičín region, containing an already standing CE 55 concrete plant with an output of 40 m³/hour. Purchase of a facility in Křižanovice, Vyškov region, containing an already standing ELKOMIX-60 QUICK MASTER concrete plant with an output of 30 m³/hour. 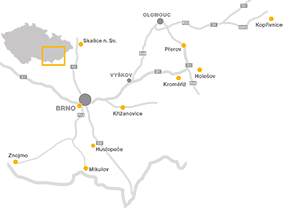 Purchase of a facility in Vyškov – concrete plant out of service. Purchase of a facility in Vsetín – concrete plant out of service. Refurbishment of the Hustopeče concrete plant, replacement of the Stetter H1-RS technology for a new modern horizontal MERKO HBS 2 DKXS concrete plant with an output of 80 m³/hour. Refurbishment of the Holešov concrete plant, adjustment of storage capacity of aggregates and binding agents, increase of output to 50 m³/hour, addition of mixing-water heating device for year-round operation. TRANSBETON Ltd. concrete plants are equipped with mixing-water heating devices. Concrete plant facilities are equipped with recycling units in order to process residual concrete. Fresh concrete is transported by the company’s own mixing trucks with capacities of 5 m³, 6 m³ and 9 m³ with the ability to transport concrete through rugged terrain. Concrete can be pumped using mobile pumps with a reach of 28 – 47 m and a reach of up to 31 m in buildings or a with a reach of up to 70 m when using stationary pumps. TRANSBETON Ltd. strives to maintain a high level of professionalism and quality of produced products and offered services, to use modern technologies and concrete plants and to keep customers permanently satisfied.